6 to 8 years for tow vehicle tires, much less for trailer tires, 3 to 4 years. .... 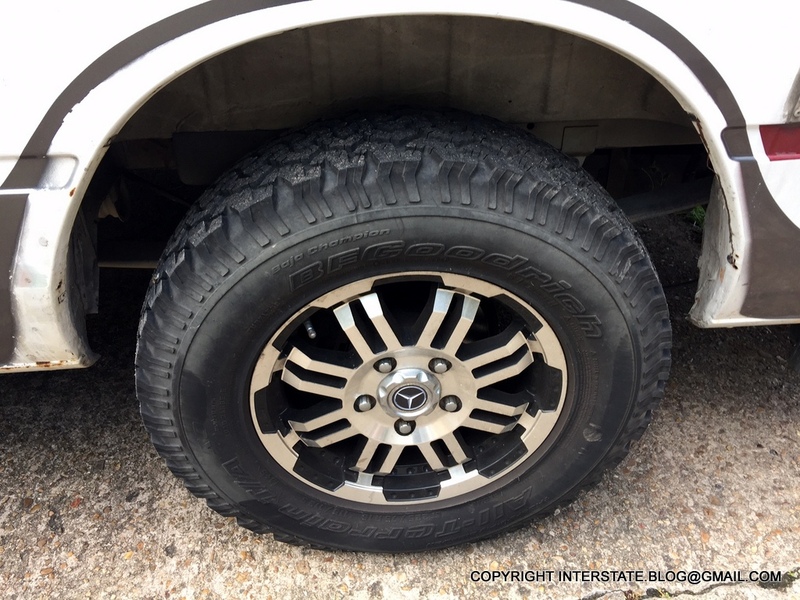 There is also an XPS Traction tire with more aggressive thread designed more for off-road use. This reminded me of something I saw last week at a local repair shop - a Gulf Stream Vista Cruiser, which is another Class B built on the T1N Sprinter. I stopped to look because I thought it was for sale, but it was reportedly just in for a transmission repair. I noticed the owner had lifted it, and put some fancy wheels on it, so I took a pic. BF Goodrich Baja Champion - first time I saw anything like this on a Class B. My guess is that the owner does some serious hunting or fishing. I don't understand why the replacement time would be any different whether it is a trailer or the tow vehicle. I can only comment on the Michelin Defender LTX. I had them on my Tundra and loved them. Better road feel, less wallowing around than OEM, and super longevity. I just put a set on my AS Interstate, and couldn't be happier. Same handling improvements that I had noted on my Tundra. Got them delivered to my door in two days from The Tire Rack for about $170 each, including shipping. They are a 4 1/2 star rating at Tire Rack as I recall. It has been awhile since this topic was discussed so will see if there are any updates. I have a 2106 AI GT Ext. I have about 27 K on the Conti's and they have never been rotated ( at least not since I bought it at 11.7K). I have been happy with the ride etc but am experiencing inside tire wear on the fronts, more on the drivers side than the passenger. Most posts indicate outside tire wear. Any experience with inside tread wear. I am certain that I can get another 10K if I rotate them but am willing to buy 6 new Michelins given that Discount Tire will rotate for free (confirmed today). The rears are in good shape so hat throwing 4 good tires away. I doubt there is much of a secondary market for the used ones but could be surprised. Any thoughts? Does Discount tire know that the tires can’t be rotated without taking them off the rims? You have 3 different types of rims on the AI. For that reason, I’ve never bothered to rotate. My Mercedes dealer agrees with me. No rotations. Keep them in alignment and balance and replace the fronts when they become worn before the rears. Mercedes dealer staff agree with me that more damage is done discounting and remounting tires than is avoided by rotation. I saw no bad effects by not rotating my tires. All wear was even. I did have alignment and road force balance on all tires. I heard the same thing from my Sprinter repair shop (in a MB dealership). I had gotten mine with 9,000 on it. Tires looked great. I had them get it aligned and they rebalance the tires when they installed the metal valve stems and tire pressure monitors. Big long trip coming up this summer (Wisconsin to Alaska and back). It will be good to see how everything looks after that. I now have 20,000 miles on my Michelins. Even wear with 75 psi and no tire rotation. Alignment was checked when I got new tires and only needed a slight adjustment to toe-in. I now have over 70,000 miles on Michelin tires installed at 40,000 mile service. There were balanced and aligned - wearing evenly. Now starting to crack from age. So I’ll replace them in the fall. They still have reasonable tread life, but are nearly six years old based on date codes.